Combining slick visual appeal, easy playability and authentic Fender acoustic sound, the T-Bucket 300CE is a bold acoustic-electric guitar for today’s player. This cutaway dreadnought is ready to hit the stage and make a sonic and visual statement with its slick contemporary style and robust onboard active electronics. Rich and full-sounding, this is the ideal guitar for those who need an instrument as unique as themselves. The heart and soul of an acoustic guitar is the top, which must be able to resonate freely for natural-sounding, dynamic tone. This guitar incorporates quartersawn scalloped bracing, artfully arranged to reinforce the crisp-sounding laminated maple top while allowing it to vibrate freely for greater projection and responsiveness. The laminated mahogany back balances the maple top’s sound, working together to create a detailed voice that brings out the best of every note and chord. 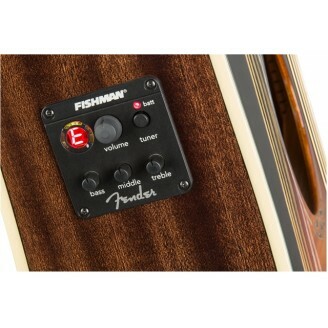 For those that want to hit the stage, the T-Bucket 300CE features an onboard Fishman® Isys™ III pickup system with active preamp, tuner, volume and tone controls for shaping the amplified voice of the guitar to match any venue. The bound maple neck sports a comfortable “C”-shaped profile that works well for any playing style, as well as a 20-fret rosewood fingerboard with a GraphTech® NuBone™ nut for enhanced sustain while eliminating string binding that can cause tuning issues. The rosewood bridge incorporates NuBone saddles for clarity and tonal consistency along with precise intonation. The aesthetic appointments include a figured top, new fingerboard inlay, rosette and headstock graphics, all of which combine to really “pop” on stage and shine in the spotlight. 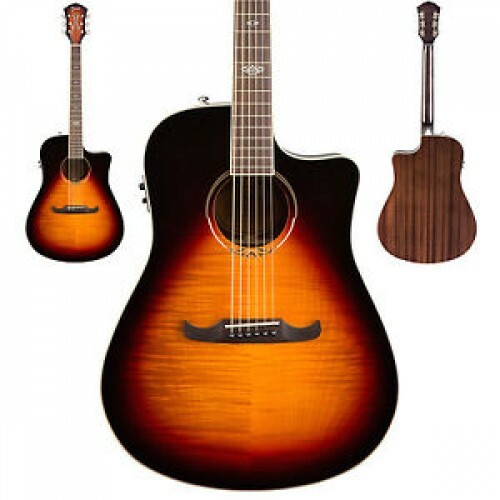 An acoustic-electric guitar designed from the get-go to rock as hard as its electric cousins, the T-Bucket 300CE is an exciting alternative to the everyday acoustic guitar. Unique Features: Aged white binding on body and neck, special “F” inlay at 12th fret.